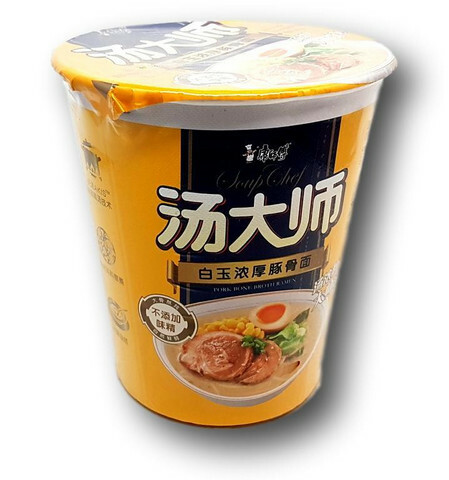 Noodle: wheat flour, palm oil, starch (E1420), salt, wheat gluten, raising agents (E501, E500), antioxidant (E339), emulsifiers (E452, E450), soy protein isolate, emulsifiers (E466, E415, E401, E425), corn starch whole egg powder, colors (E164, E101). Soup: palm oil, pork bone seasoning sauce, pork bone oil, soy sauce, sesame oil, flavor enhancer (E635), spices, sugar, onion oil, ginger oil. Oil: palm oil, garlic oil. 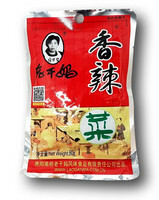 Dried vegetables: cabbage, corn, sesame, dried egg, sugar, corn oil, sweetener (E420), emulsifiers (E451, E450, seaweed, onion. 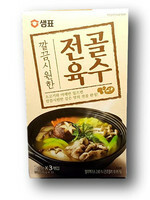 Contains wheat, soy, sesame and egg.